When he is born, Hiznobyuti is not exactly handsome. In fact, his parents and siblings say, "He's no beauty!" They say it so often, Hiznobyuti assumes it is his name. Wherever he goes, only embarrassment and shame await him. Hiznobyuti hides himself away, working on his inventions, until one day he receives a message from the stars. After a fight with his family, Hiznobyuti decides to run away. On a beautiful adventure by himself, he learns the secrets of the universe: how to communicate with trees and birds, how to wake up the sun, and how to see himself for who he truly is - a hero! When he returns from his journey, Hiznobyuti family rejoices and apologizes for not understanding how beautiful and important he was to them all along. Claude Ponti is a French illustrator and children's author known for his inventive and playful use of words and the symbolic nature of his illustrations. His first book, L'Album d'Adèle, written for his newborn daughter, already displays the associative and dream-like presentation of children's interior lives that characterizes many of his works. Ponti was awarded the 2006 Sorcières Spécial prize for his contribution to literature, which now includes over seventy books of all types and for all ages. About the Translator: Alyson Waters is a translator of modern and contemporary literary fiction, criticism and theory, as well as art history. Her book translations include works by Vassilis Alexakis, Louis Aragon, Daniel Arasse, René Belletto, Reda Bensmaia, Emmanuel Bove, Eric Chevillard, Albert Cossery, Yasmina Khadra and Tzvetan Todorov. She teaches literary translation workshops at Yale University and at New York University, and now at Columbia. In addition to her work as a translator and teacher, she has been the editor of Yale French Studies for almost twenty years. She is the translator of Claude Ponti's My Valley (Elsewhere Editions). 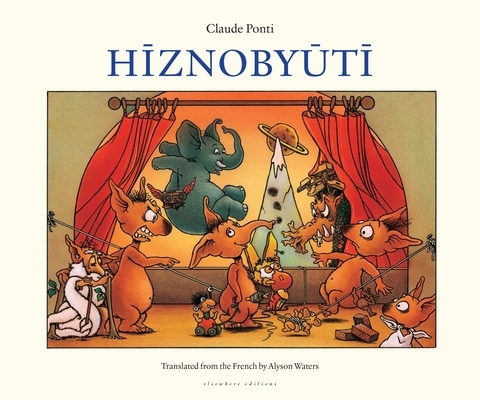 "Claude Ponti, in my eyes, is one of the most essential authors in the whole of children's literature. His bursting creativity and the wealth of his images incite the almost systematic pleasure of children. The Pontian universe, with its many cultural and artistic references, its themes and its language distinctive of the world of childhood, its originality in its forms, colors, typography, and the arrangement of its scenes, presents an offering of narratives that strongly engage children's emotions and which meet them on the horizon of their expectations. Here children often find the power that a new piece of knowledge or the control of a word bring, which allows them to influence their destiny just a little bit more."